With the last name Murphy, it is an absolute sin if you don’t know how to make Irish Soda Bread. The scrumptious yeast-free treat is ubiquitous with St. Patrick’s Day parties around the globe. While it is not the most traditional, this Irish Soda Bread recipe with Chocolate Chips and Orange Zest might be the most delicious. Since citrus is in season, I thought it might be fun to kick up the normal Irish Soda bread recipe a bit. I hope you like it. This Irish Soda Bread would be great as an appetizer at your St. Patrick’s Day fête. It is so delectable you might even get away with serving it as a dessert. With the KitchenAid® Stand Mixer the dough is quick to make. Start by preheating your KitchenAid® 30″ Combination Wall Oven with Even-Heat™ True Convection to 375 degrees F. Next, cut the butter into squares. 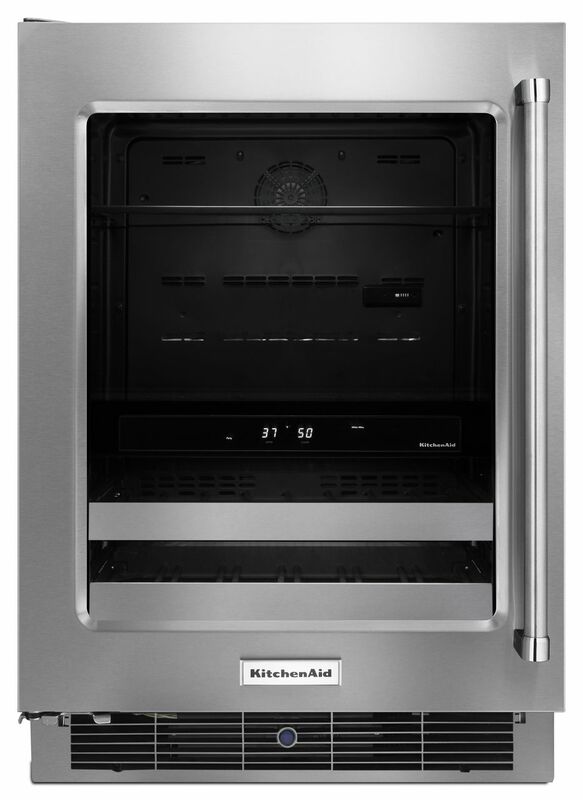 Place the butter into the KitchenAid® Multi-Door Freestanding Refrigerator until you are ready to use it. P.S. 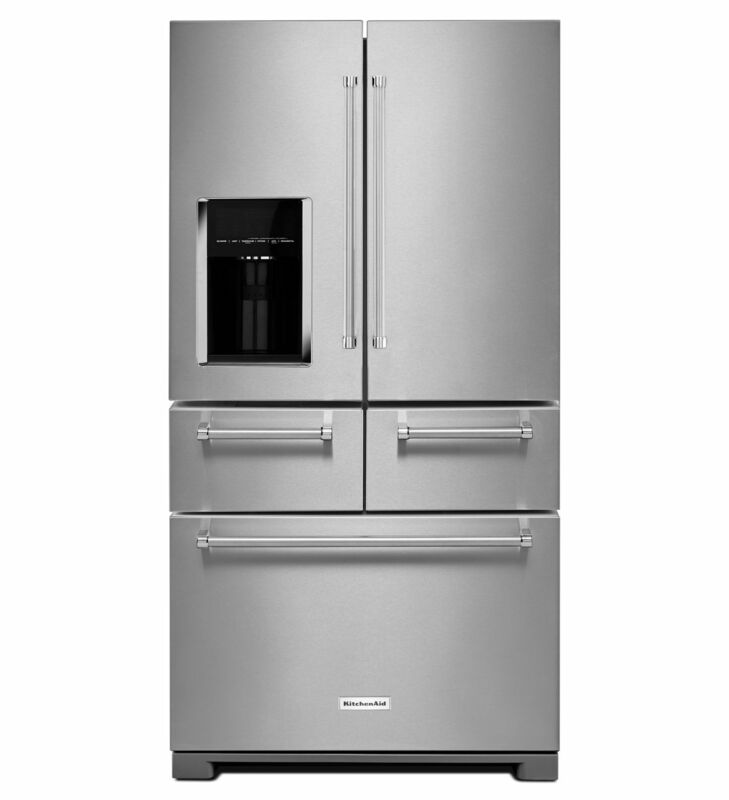 I am OBSESSED with my new black stainless Multi-Door Refrigerator. The color is amazing, and the middle drawers…oh the middle drawers. Let me count the ways I love you. The left drawer has 5 temperature settings for meat/fish, drinks, greens/herbs, deli/cheese, and thaw/marinate, while the right drawer includes a Produce Preserver and keeps all of my fruits and vegetables really fresh! 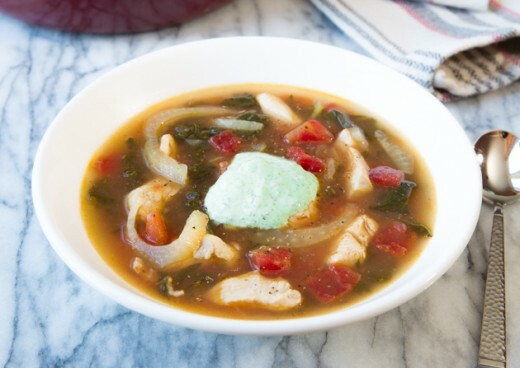 But, back to this recipe. Using the whisk attachment, combine the flour, sugar, salt, and baking soda in the Stand Mixer. Add the butter square by square. Replace the whisk attachment with the flat beater attachment and mix until the butter combines with the flour into small bits the size of peas. You may need to use your hands to break up any clumps. Next, prepare the orange zest if you haven’t already. Then whisk together the zest, buttermilk, and egg in a separate bowl. Replace the flat beater attachment with the dough hook on your Stand Mixer. Add in the wet ingredients and the chocolate chips, and mix until combined. Knead the dough by hand for a bit adding flour until the dough isn’t sticky. 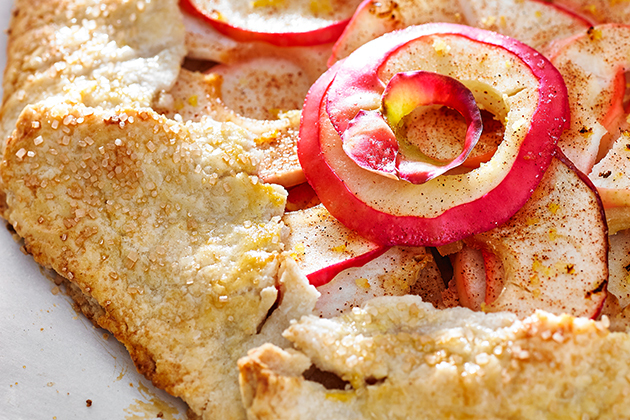 Shape the dough into a circle, and place it on a greased KitchenAid® Professional-Grade Sheet Pan. Cut an “X” into the top of the dough. My handy little 3.5″ Paring Knife from the KitchenAid® 11pc Professional Series Cutlery Set did the trick. Bake the dough in the Combination Wall Oven for about an hour to an hour and 15 minutes. When the bread is done, it will be crispy on the outside but done in the middle. Stick a knife into the center to make sure it is not doughy. Let the bread sit for a couple of minutes before serving. I suggest serving the bread with some cold Guinness for your St. Patrick’s Day soirée. This KitchenAid® 24″ Stainless Steel Beverage Center might be the most useful thing in our house. We keep it in the living room for easy access during games and movies. There you have it…my Orange Marmalade Irish Soda Bread with Chocolate Chips. Happy St. Patty’s Day! 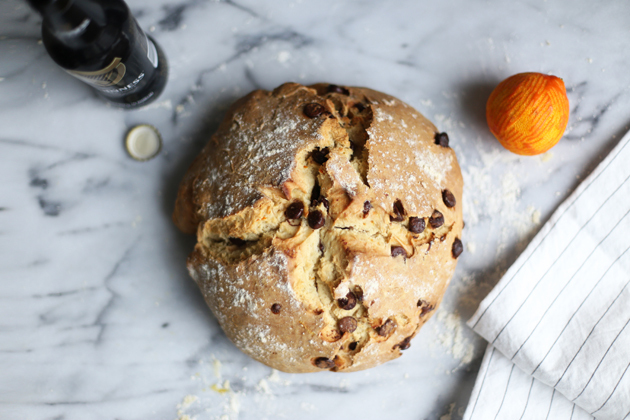 Be sure to share your take on this Orange Marmalade Irish Soda Bread recipe with us on Instagram using #MadeWithKitchenAid for a chance to be featured. 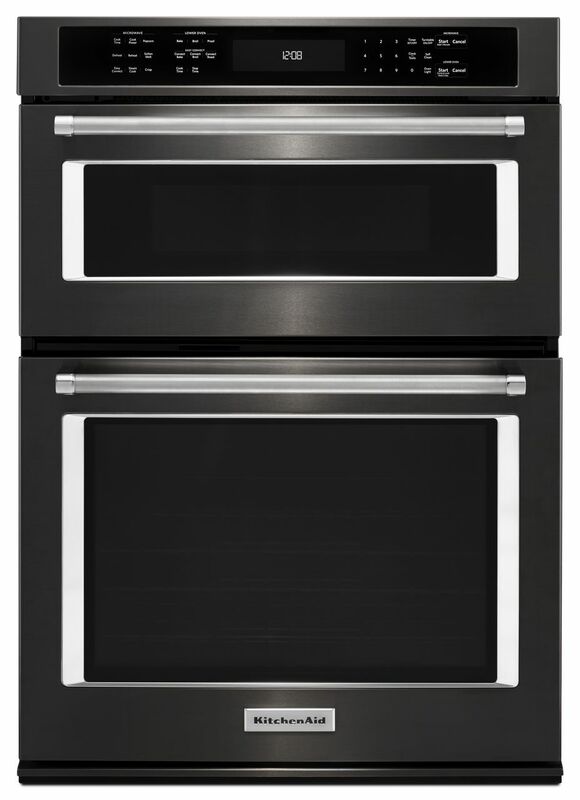 Preheat the KitchenAid® 30″ Combination Wall Oven with Even-Heat™ True Convection to 375 degrees F.
Cut the butter into squares. Place the butter into the KitchenAid® Multi-Door Freestanding Refrigerator until you are ready to use it. 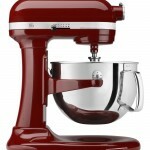 Using the whisk attachment, combine the flour, sugar, salt, and baking soda in the KitchenAid® Stand Mixer. Add the butter square by square. Replace the whisk attachment with the flat beater attachment and mix until the butter combines with the flour into small bits the size of peas. You may need to use your hands to break up any clumps. 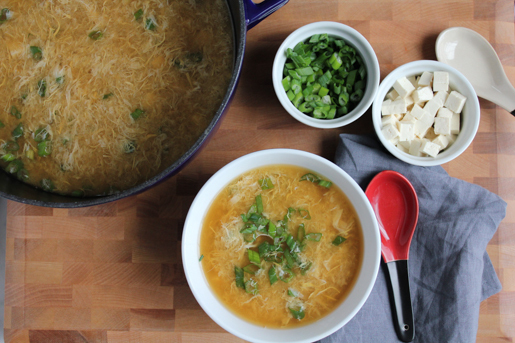 In a separate bowl, whisk together the zest, buttermilk, and egg. Replace the flat beater attachment with the dough hook on your Stand Mixer. Add in the wet ingredients and the chocolate chips, and mix until combined. Knead the dough by hand for a bit adding flour until the dough isn’t sticky. 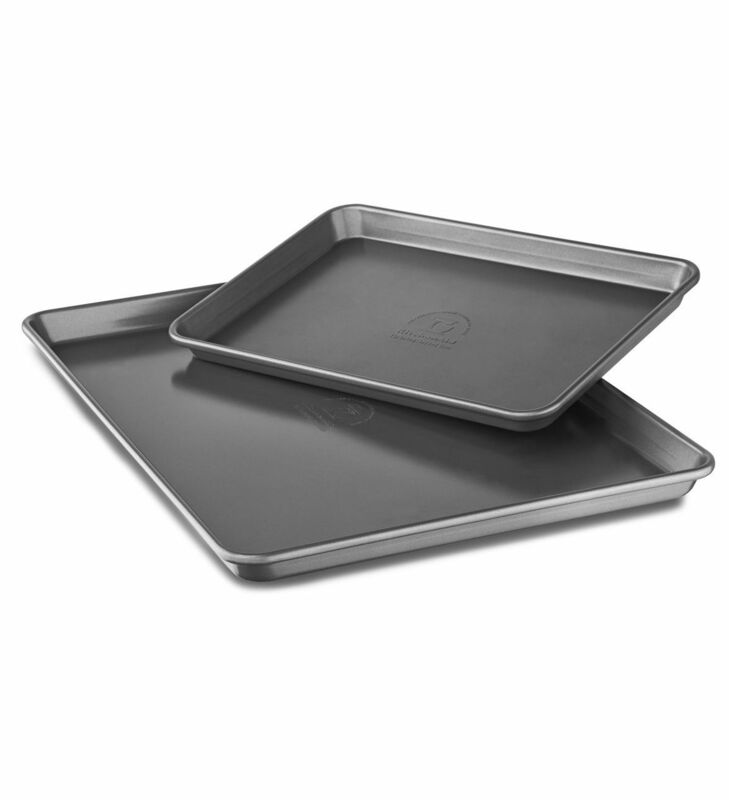 Shape the dough into a circle, and place it on a greased KitchenAid® Professional-Grade Sheet Pan. Cut an “X” into the top of the dough. 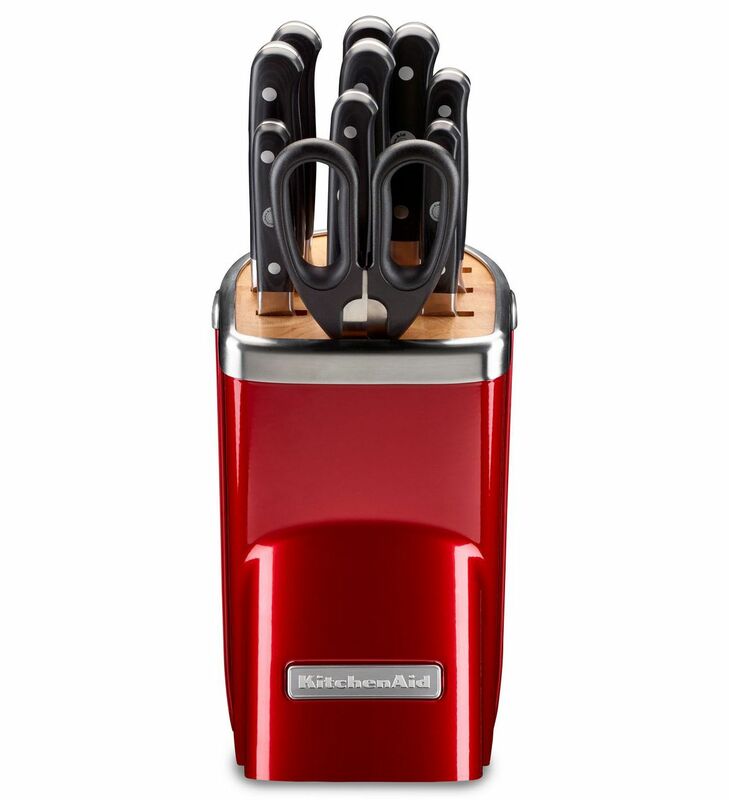 My handy little 3.5″ Paring Knife from the KitchenAid® 11pc Professional Series Cutlery Set did the trick. Bake the dough in the Combination Wall Oven for about an hour to an hour and 15 minutes. When the bread is done, it will be crispy on the outside but done in the middle. Stick a knife into the center to make sure it is not doughy before serving. Serve warm with butter.